Description: Sotheby Parke Bernet Inc, 1980 dark grey cloth hardcover with gilt lettering to front cover and spine: decorative dust jacket: approximately 9 x 9.5" tall: unpaginated catalogue of 260 lots: black and white photographic illustrations and full-page coloured plates to most facing pages. 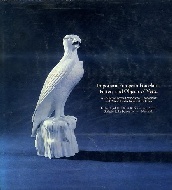 Synopsis: A catalogue of important European porcelain, pottery and objects of virtue, a collection formed by Nelson A Rockefeller and offered at auction for the benefit of his estate on Friday, April 11, 1980. The comprehensively illustrated catalogue includes gold mounted enamel miniatures of Benjamin Franklin, many fine examples of Chelsea China, Bow figures, Worcester porcelain, Astbury- Whieldon figures, Ralph Wood figures, Continental Faience and Delftware, and fine Continental Porcelain including Hochst, Nymphenburg, Meissen, Chantilly, Mennecy, Vincennes, and Sevres. Conditions: very clean and good overall. Mary Ward Books is an independent online bookstore specialising in second hand, out of print books and used books such as A catalogue of Important European porcelain, pottery and objects of virtue. sale number 4358 by Sotheby Parke Bernet Inc. We offer a book search facility and secure payments via PayPal and Nochex. Mary Ward Books is based in East Anglia, United Kingdom. We were established in 1997 and have been selling books online since 2002. We ship worldwide, please click here to see our shipping charges for A catalogue of Important European porcelain, pottery and objects of virtue. sale number 4358 by Sotheby Parke Bernet Inc.